A dolphin usually found in much warmer waters has died after it somehow ended up off the west coast of Vancouver Island, according to rescuers. 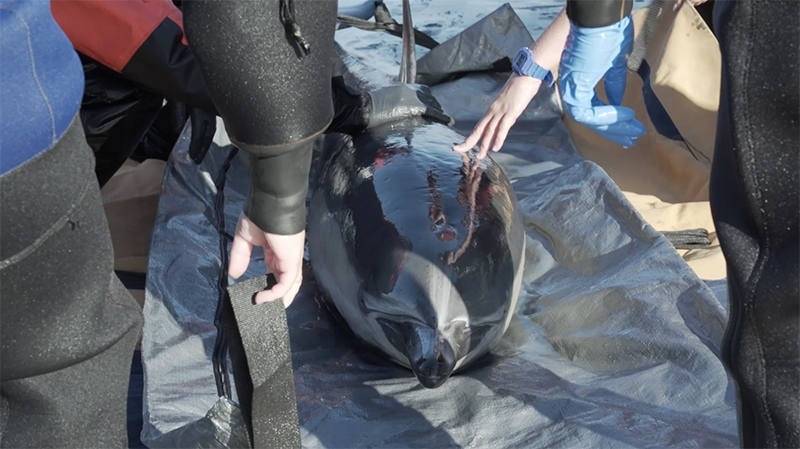 The Vancouver Aquarium Marine Mammal Rescue Centre was called in to assist with the rescue of what is believed to be a long-beaked common dolphin that became stranded on a shoreline of Pacific Rim National Park near Tofino on Thursday. The species of dolphin usually lives in tropical and subtropical regions like the waters off western and southern Africa and South America, according to the rescue centre. It has only rarely been sighted off the coast of Washington State and B.C., which is considered the very northern edge of their range. BC Parks staff initially tried to refloat the adult male dolphin so it could swim away, but it didn't work. Employees then held it in shallow water until the rescue centre team arrived to help within hours of getting the call. “The number of people who worked together in an effort to save this animal was fantastic,” said rescue centre manager Lindsaye Akhurst. Sadly, the dolphin remained in critical condition and shortly after crews began to transport it back to the rescue centre's headquarters in Vancouver, it stopped breathing and was prounounced dead. The cause of the dolphin's death is unclear, and a necropsy will be performed to determine what happened. Experts say sightings of tropical and subtropical species in waters further north than they're usually found are becoming more common. Anyone who sees a marine mammal in distress is asked to keep themselves and pets away and call the Fisheries and Oceans Hotline at 1-800-465-4336, or the Marine Mammal Rescue Centre at 604-258-7325.